Is it because I am a woman, a therapist with a trained ear, who has listened to countless women with similar stories, that I believe Dr. Christine Blaisey Ford’s story? There are so many ways in which Dr. Ford’s narrative felt compelling and believable. As television cameras rolled, her voice shaking with anxiety, I again bore witness to a sexual abuse survivor willing to walk through the trauma of truth telling—this time, to a national audience. I took note of how she paced the telling of painful details, and her deliberate effort to be even-handed in her story as she declared only what, as a highly trained psychologist and woman under sexual siege, could she ascertain. The day we awaited the release of the FBI report to the Senate, I tuned into Rachel Martin’s NPR interview with Missy Bigelow Carr, a long-term friend of Judge Kavanaugh. She did not believe Dr. Ford’s account and could not consider any part of it as true. At one point, after Ms. Carr asserted, there’s a lot of holes in the stories of Ford,Ms. Martin observed, it is common to have holes in one’s memory, that you can’t recount, necessarily, the address where it (the assault) happened. Well, that there’s holes are one thing. But lies are other things. I mean…fear of flying not true. The second door on the house —again, the data, the history shows that this—the second door was put on four years before the therapy session that apparently was about this incident. 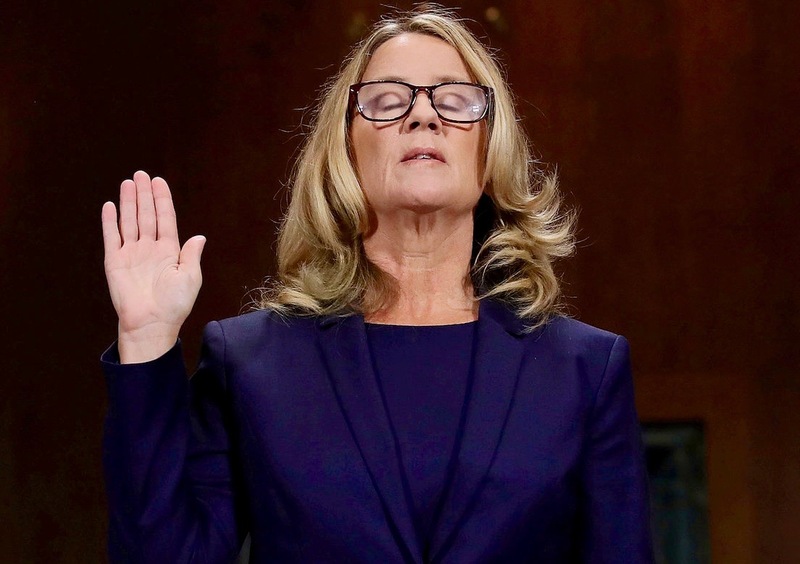 Dr. Ford did state that she had a fear of flying and yet, acknowledged that she did fly. I understood that although the fear of flying limited her options, that in special circumstances such as trips across the country to visit her parents, work commitments, and testifying to Congress, she found a way to cope. At one point in my life, when my children were young teens, I developed an intense fear of flying. For days before a necessary professional trip, I practiced specific coping imagery. On the day of the flight, I sat in an aisle seat to assure my mobility and during the trip, I often closed my eyes to envision safe landing and walking onto firm ground. Like Dr. Ford, I understood the power of specific strategies for coping. Making no sense to her architect or her husband, Dr. Ford insisted on a second door years before her secret propelled the couple into therapy. The need for protection was so strong that even the embarrassment of double front doors for all to see did not prevent her from such an unusual and unaesthetic decision. The extra door meant safety and safety was all. There is no turning back from the disregarding, vitriolic Senate Supreme Court election we have lived through this past week. Just as Dr. Ford feared, she was deemed a woman who “ruined a good man’s reputation.” She needed more than two front doors to keep her safe from President Trump’s egregious, inflammatory words in which he mocked her testimony to a cheering and raucous crowd in Mississippi. I was appalled and disgusted by his careless and hurtful rhetoric. After all this, for what am I grateful? I am grateful to find the words for this blog. I am grateful for Dr. Ford’s courage to stand before so many and lead the way for other silent survivors to step forth and participate in a dialogue about sexual abuse that is long overdue. I am grateful to add my name to the many women and men who believe Dr. Ford’s truth and stand by her. May she stay safe. This entry was posted in Currents, Mindfulness, Politics, Relationship(s), Uncategorized, Well-Being, Writing and tagged Dr. Ford's truth, safety is all, sexual abuse, the extra door on October 8, 2018 by fayewriter. I like the tone of this essay–which is emphatic and sure. I like how the tone is emphasized by the writer’s choice of phrases such as “national audience” and “no turning back,” which capture the escalation in political tensions, as well as in what’s now at stake for the country. Thank you, Rosemary, for appreciating one of my major intentions and underscoring my sense of what’s at stake for our country.